8/7 Cup of Coffee: Xander Bogaerts played third base for the fifth time in his last 17 games, Matt Barnes was up-and-down for the Sea Dogs, while Brian Johnson and Daniel McGrath pitched well in A-ball. Wendell Rijo helped lead the GCL Red Sox to an impressive comeback victory, and Jeremy Hazelbaker (pictured) slugged two home runs for the PawSox. It was a tough night for the PawSox, as they lost to the Buffalo Bisons (TOR), 12-8. Xander Bogaerts got the start at third base, going 1 for 5, while also committing an error in the field. He booted his first chance of the game and then handled his next chance cleanly in the seventh. 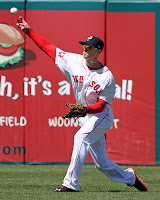 Will Middlebrooks was the designated hitter, and he went 1 for 5 with a home run and two strikeouts. Hazelbaker went 3 for 4 with two home runs to lead the offense. Making his Triple-A debut, Keith Couch only lasted one inning, allowing four runs and throwing 45 pitches. Jose Contreras allowed six runs in two innings, and Chris Martin allowed two runs in 2 1/3 innings. Anthony Carter was able to stop the bleeding, throwing 1 2/3 scoreless innings, but it was too little, too late for the PawSox. Matt Barnes was up-and-down on Tuesday, as the Sea Dogs were defeated by Richmond Flying Squirrels (SF), 8-2. Barnes's final line was similar to those he had earlier in the season, as he allowed four runs, three earned, in 5 2/3 innings, while walking only one and striking out seven. He now has 120 strikeouts in 94 innings, but his ERA sits at 4.40. Noe Ramirez and Eric Niesen threw the final 3 1/3 innings, surrendering two runs apiece. Christian Vazquez continued his recent hot streak, going 2 for 3 while driving in two runs, as he raised his average to .277. Shannon Wilkerson went 1 for 3 with a double and a walk, and J.C. Linares went 2 for 4 with a double. Salem fell to the Wilmington Blue Rocks (KC), losing 3-0 in a rain-shortened five-inning game. William Cuevas pitched all five innings, allowing three runs on five hits. Stefan Welch, Mookie Betts, and David Chester collected the only hits for Salem, with Chester also drawing a walk. Brian Johnson threw six strong innings, but the Drive fell to the Kannapolis Intimidators (CWS), 5-2. Johnson allowed only an unearned run in his six innings, surrendering three hits and two walks, while striking out five. Yunior Ortega was not able to match Johnson's success, as he allowed four runs in two innings, picking up his sixth loss on the year. Sean Coyle went 2 for 4, and Jesus Loya went 2 for 4 with a double, while driving in both of Greenville's runs. Daniel McGrath's sparkling relief performance helped the Spinners squeak past the Scrappers (CLE), 4-3. Jamie Callahan, who was perfect in his last outing, was not as good on Tuesday, as he gave up three runs on five hits in 4 2/3 innings. McGrath followed him out of the bullpen, and he was dominant, striking out four without allowing a baserunner in 2 1/3 innings. Brayan Villarreal made his system debut, pitching a scoreless eighth inning, and Joe Gunkel struck out the side in the ninth to pick up his fourth save. Danny Bethea went 2 for 4 with two doubles and a walk, and Tzu-Wei Lin went 2 for 5 with a double. Bethea's double in the sixth inning tied the game, and then he walked with the bases loaded in the seventh to put the Spinners ahead. A six-run seventh inning propelled the GCL Red Sox to a 7-6 victory over the GCL Orioles (BAL). Gabe Speier struck out two in a scoreless first inning, and Stephen Williams picked up the win with two perfect innings of relief. Christian Perdomo and Rob Smorol were hit hard, combining to allow five runs in four innings. Down 6-1 in the bottom of the seventh, the Red Sox scored six times to take the lead. Bryan Hudson and Iseha Conklin each hit RBI singles, Wendell Rijo added a two-run double, and Aneudis Peralta put them ahead with a single to center. Rijo broke out of a mini-slump, going 3 for 4 with two doubles, and Nick Longhi added a double and a walk. The DSL Red Sox are now 36-19, as they beat the DSL Dodgers (LAD), 5-2. Victor Acosta went 3 for 4 with his sixth home run of the year, and he now has more home runs than the rest of the team combined. Luis Alejandro Basabe went 2 for 4 with a double, and Jhon Nunez added an RBI double as well. Yankory Pimentel threw six innings, allowing three runs on two hits while striking out five, and Victor Ramirez picked up his 10th save with a scoreless ninth. Player of the Day: Jeremy Hazelbaker's two home runs now give him 10 on the season, and this may be the night he needed to break out of a prolonged slump. Hazelbaker entered the game 7 for his last 38, and his OPS dipped below .700 on the season. After last night's contest, Hazelbaker is now hitting .269/.322/.394 in 100 games this season for the PawSox.